Announcing the release of “A House of Locked Secrets” for The Dark Mod! The mission should also shortly be up on the in-game downloader. 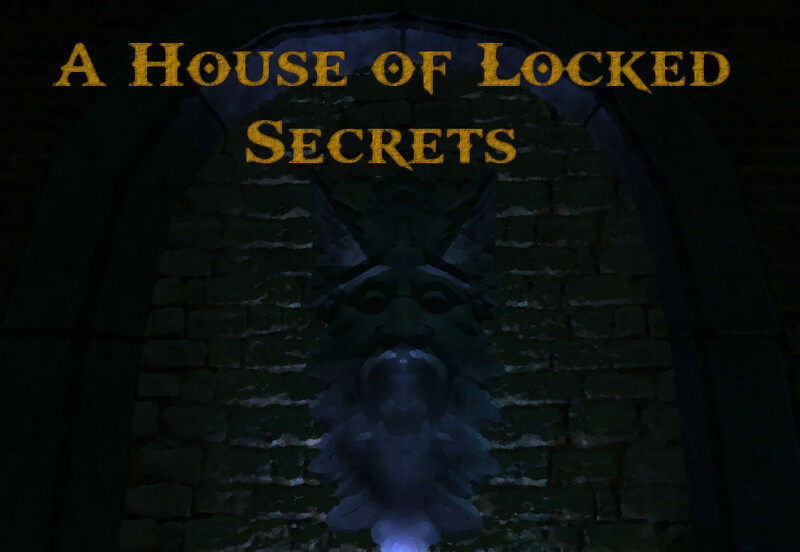 -A House of Locked Secrets is a campaign, with two levels. -The mission is also a sequel to the Dark Mod FM “Requiem”. While you don’t need to have played Requiem to enjoy this mission, it is recommended, as it will help you better understand the lore of this corner of the TDM universe. -There is a companion novella to this series, Shadowcursed, available at Amazon.com or Smashwords.com. If you beat this FM, you can get a coupon code for 50% off the price! -The map you get of the manor is an automap which tells you which room you are currently in. Use it, along with the compass to help find your way. -Most inventory items in the game can be dropped, so no need to carry them around after they are no longer of any use. -If you use noclip or other console commands while playing, there is a good chance that you will break the intended flow of gameplay. Additional Music: cmusounddesign, Gigagooga, Lee Rosevere, Leonardo Badinella, Marianne Lihannah, NewEonOrchestra, Sarah Eide, Tabias Scot, Zoro. Additional Sounds: club20sound, ERH, geoneo0, Grayman, kevinkace, nothayama, qubodup, SoundsExciting, speedygonzo, swiftoid, viznoman. After a lot of work ‘A House of Locked Secrets’ is finally ready for everyone to play. More than anything else, this FM was a team project. If the official TDM campaign never gets released, you might consider this to be the unofficial one, as almost everybody on the core TDM team lent a hand toward its completion. Of the many contributors, I especially want to thank SteveL whose custom code turned what was just an idea in my head into the FM you now get to play. I also want to thank Bikerdude, who performed a lot of optimization work on the map, and Goldwell whose voice brought to life many of the mission’s characters. If you like the music in the FM, check out the work of Sarah Eide (www.saraheide.com) who composed most of the custom soundtrack. Also, Marianne Lihannah makes a return from Requiem with a few songs, so check out her work too (www.funeralsinger.net). They'd both love to hear from you, so if you liked their music, let them know! On a personal note, I hope that this FM will give you a few hours of enjoyment, and if it does, feel free to drop me a line either in this forum thread, my work blog, or via email. In the future, other writing and game projects seem set to take up a lot of my time, so I give permission for anyone (preferably the TDM team) to update both Requiem and A House of Locked Secrets to fix any bugs or compatibility issues. I just ask that fixes be limited to correcting for glitches or for issues that come up due to future TDM releases. I do give permission for people to make visual & gameplay changes too but ask that you release these changes in a separate version than my release, and I ask that you make no changes to the story, readables, and plot. With that all out of the way, I want to thank you again for downloading and playing ‘A House of Locked Secrets’; I hope you enjoy it. Edited by Moonbo, 30 May 2015 - 10:33 AM. Does Amazon or Slashwords give you a bigger cut of the profits? Will upload to the official mirrors when I get home this evening. @Jaxa, I think both take the same cut, so it's a matter of your personal preference :-). for another excellent mission. Using the Holy Symbol reminds me of Clive Barker’s Undying. Oooh man I have been waiting for this since Requiem, will definitely give it a spin this weekend! Congratulations on the release Moonbo! On the second test, I pick up the lockpick but when I return to the natural world, the lockpick is not in my inventory as I think it should be and I cannot proceed. What am I doing wrong? Thanks. There story was interesting and very well told. Most of the readables had a pleasent length so I never got tired of reading them, which is something that sometimes happens in other missions and can cause me to miss important hints. That didn't happen here, although it took me some time until I understood what to do with the heart of the monster (I think it was the north wing objective). The idea and the implementation are very well made. The stealth requirements were fine as the mission was more focused on solving the puzzles. However, there are two minor issues I had. I would have liked for the puzzles to become more complex towards the end, with several spiritual worlds differing from each other or so. The setup was mostly pretty straight foreward, which is ok, but I think there is some room left. Another thing is the final part. It took me ages to find out that I have to use the symbol on the fountains again. I expected them to just put me back into the spiritual world again, as all the other objects before did, but that wasn't the case. You break with your game concept here without communicating this to the player, which is not optimal. I must say that this is the best mission I've played thus far, and that I'm even a bit proud of having participated on it. Although the main honor definetely goes to you, Moonbo, for creating this masterpiece. Thanks a lot, mista. Thanks for the kind words :-). Yeah, I agree with you when it comes to puzzle difficulty. I personally get very easily stumped by puzzles in games so I tend towards easy problems, especially for the main plot. My plan was to have more tougher brain-twisters as optional content, but as I was building the map it got so large (in terms of primitive and entity counts) that I just ran out of space and time to do more side content. I guess that's a downside to having a one-man mapping team on a project, only so much attention to go around :-). Regarding the finale, you say you had to use the holy symbol on the fountains twice for them to work? If so that's definitely a glitch, as they should work like any other realm gate...or do you mean the fountains in the physical world didn't act as gates? If so, I guess I'll take a mea-culpa on that one as the goal was to force the player to get close to Gurgan each time he needed to get back into his spirit realm. I had originally used your updating text script, but I ran into a problem where the spawnarg that was used to update the text could only hold something like 250 characters, which meant that the notes pages could never be filled up before running out of space. In the final version of the map I just swap out one version of the readable with another each time the notes get updaed, which can happen because you get the updates in a linear order. The automap worked great though, and I only needed to tweak it slightly to get it to work like the T2 automaps. Turned out to be a great feature! Two things that appeal to me are the amount of detail and the good optimization. Even though the areas are very detailed and make a very good use of light, I didn't had any performance issues. This was especially surprising on the outside part in the second mission. Gratz for the relese, will look to it . @Bikerdude: Well, I've bought my pc six years ago or so and it wasn't overhelmingly fast back in the day either, so I notice it very clearly if maps are not optimized well. So again, great job. @Moonbo: Yeah, now that you mention it there was some restrictions to the amount of chars a string can hold. I've completely forgot about that. However, it wasn't meant as criticism anyways, I was actually thinking you'Ve overlooked that. As all criticism mine is subjective, so do not take it as the holy word. And yes, I can imagine that due to the size of the mission you've encountered some restrictions, although I think that more persons working on it would not have been of much use here, it's a simple restriction. To be more clear on the final part. I've used the symbol on the hammer to get into the spritual realm, and there I've used it on the fountains to get back to the real world. What I've meant is, that after that I had to use the symbol on the fountains in the real world again to destroy them or whatever I've done there (I'm just guessing from the sound effects). But I expected that using the symbol again on them would just put me back to the spiritual world, which isn't the case. I more or less stumbeld over the solution as I guessed I'm in the wrong cage (the places where the fountains are, don't have a better word for them). Damn, I've gotten behind on my TDM playing, and lo and behold a new mission from Moonbo, Sotha and Bikerdude/Baal. WTF?!? !